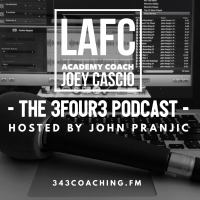 Joey Cascio, head coach of the LAFC Academy, invited me down to help with a training session recently. Of course, I took advantage of this opportunity to experience the inner workings of the newest MLS academy program. The session was good. The players were motivated and talented. The setting on the campus of California State University Los Angeles (CSULA) was also quite remarkable. After training, Joey and I found some real estate to sit and chat for a while. We talked about the sessions and he deconstructed everything that happened. He painted a picture of the past, current, and future not only for himself as a coach, but for this group of young players and LAFC as a whole. Links to everything we discuss are provided below. I highly recommend following Joey’s journey on social media. Is this available on iTunes? I am not seeing it. Yes, all the episodes are on iTunes. This was a great podcast. I am taking to heart much of what you two discussed, and am very thankful Joey was so open with discussing his routine. I am still wondering how coaches like you, Joey, and Brian set up scrimmages so that you guys can see the players execute the pattern choreography under game-like conditions. My team works on phase 1 patterns every practice , but I need to know how to best make a conditioned scrimmage to allow them to manifest the patterns. I’m not a fan of how the USSF coaching courses recommend to construct their “expanded sided games” and would much rather be advised from someone in the 3four3 family.